The Mendips, but without Tetley! How would we cope? The minibus sailed through the night, unladen with piss BDHs, and we loaded up on delicious spice and flavour to cook with. At the hut we marvelled at the newly refurbished SMCC — a huge new kitchen, lovely sitting room and heating throughout. One of the most exciting features of the old SMCC was the communal showers, and despite the shower rooms moving and being completely refurbished, these remained, giving a wonderful 'back-at-school' feel to the whole place. 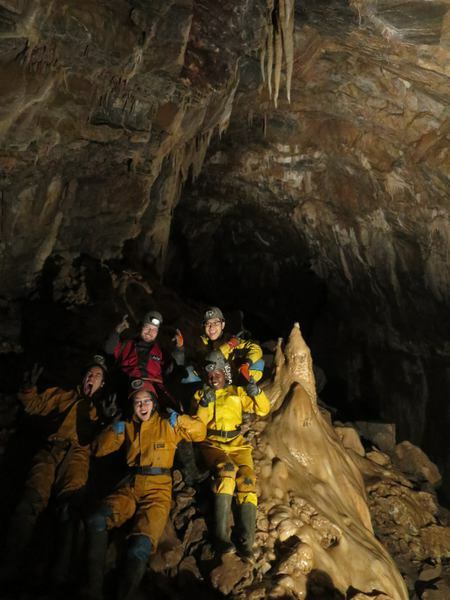 We played a few caving games and slipped off to bed, preparing for the excitement that the morning would bring. Jack loves Swildon's. I love route finding in the entrance series, I love rigging the ladder, I love climbing down through the nasty slanting rift, I love finding Tratman's temple, I love the upwards sloping phreatics with their calcite floors, I love the downwards sloping phreatics with their calcite floors, I love looking at Blue Pencil but not going down it, I love bailing the ducks and then ducking them, I love the Birthday squeeze, the slippery Landing, the dive through Sump 1, the route up the streamway and back out of the entrance, home for tea and medals. So that's what we did. I grabbed two keen freshers, convinced Tanguy that Peter and Kenneth should have a chance to lead by themselves, and soon we were in Swildon's, found the route through the entrance (wet route, lead by Tanguy), rigged the ladder (well, Tanguy did), avoided the nasty slanting rift downclimb through a nice alternative over the top (again, thanks Tanguy) found Tratman's temple (that was me, look for the nice columns before a steep route down), climbed up the phreatics, down the phreatics, pondered Blue Pencil and bailed the ducks for thirty minutes before Tanguy lead us through to Birthday squeeze, which we squozed/squizzed our way through before slipping down the Landing to Sump 1, which I stared at until I realised I was freaking out the novices and I dived through, moving quickly on the other side to warm up before we got to entrance series, checked out the long dry route (very pretty, take the left passage instead of the right which leads to the short dry route) and got out in the sunshine, home for tea and medals. Huge amounts of rice, chilli, salsa, refried beans and sour cream later, Janet showed up with bathtub scrumpy and we enjoyed the numbing feeling of methanol as it destroyed our livers. Various increasingly stupid variants on the impressive squeeze machines were tried, including a mid squeeze table traverse, and Kenneth managed to seriously damage himself and I can only assume the squeeze machine in the process. Ben hates Swildon's. His reason is that he's been there too many times, however he has been there twice and has never been through sump 1 so many are understandably frustrated by his uninformed opinion [Correction: Ben has been through Sump 1 but not done the short round though]. To appease our president, and being the accommodating and generally great person that I am, I agreed to go to a "Not Swildon's" cave in the Mendip. 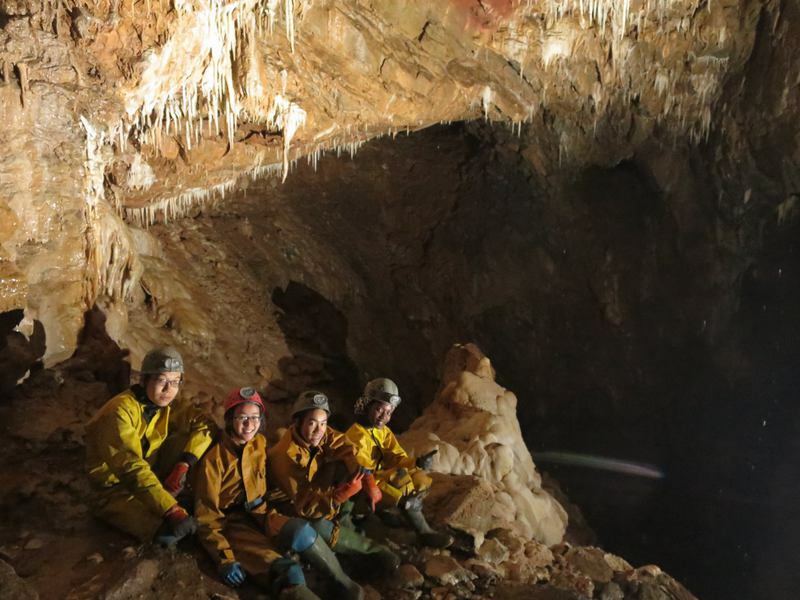 Months of research ensued, employing and the finest minds the caving club has to offer and using billions of pounds of tax payer money that could have otherwise funded the ailing NHS but in the end it was worth it. We managed to identify "Longwood Swallet" as a cave both that is both in the Mendips and is not Swildon's. Incredible! Descriptions of the cave include words like "very wet", "literally in a waterfall", and "floods often and at random due to the Bristol Water Company". But we had an inside tip from a canoeist that all the rivers in Wales were dry. Extrapolating based on a remarkably poor understanding of geography we decided this meant the water levels in Mendip would be low and therefore it would be the perfect time to visit this otherwise intimidatingly wet cave. We readied in the morning. I begin by getting bored of trying to decipher what rigging was necessary from Mendip Underground (making up for a lack of cave with an abundance of words is a common theme of MU) and instead packed all the ropes we had left after the Swildon's lot had taken theirs, plus one ladder. I also snapped up the Wilson brothers as mine and Ben's novices du jour. I figured these two former scouts would be the mostly likely to be prepared for sudden flooding. Ben navigated expertly. Past the Charterhouse activity center, and down a lane towards "Lower Farm". We park on a grassy verge not far from the junction and just round the corner from the farm. We change and attempt to follow the directions on the laminates Ben had printed. There's things about rising fields, following boundaries, a stile, a wooded valley. We wander uncertainly, managing to make the landscape around us fit this description until Ben suggests that he go back and get his phone, which can GPS us there. We already have a daren drum for stashing the keys in so he goes to retrieve it. The Wilson's and I sit in a grassy meadow. The sun shines, and though chilly, the air is relatively still and pleasant. Ben returns and we follow his phone back the way we came and past the minibus. A farmhouse is nestled in a wooded valley, and has lots of no trespassing signs. We consider our options and attempt to skirt around it. We climb up an overgrown path and scramble through some trees. Once past the farmhouse we tumble back down into the valley and after some further scrambling emerge on a path, with a wooden bridge. The bridge is on the description we have and so we quickly find the concrete entrance to Longwood not much further down the path. Ben attempts to unlock the gate whilst I do as the description suggests and amble down the small stream to find where it sinks. 20 metres further on it sinks into a small but deep rocky depression. Apparently if the water is not overflowing here it is a good sign that the cave is not too wet. I return to finish the unlocking process. I let Jimmy Dubz carry the bag and climb into Longwood. The entrance is initially a slippery, drippy climb down. From what I've read I think it was relatively dry compared to normal but it was still unpleasant. At the bottom of the climb a small passage leads off. I insert myself feet first and wiggle down. It quickly becomes quite tight and committing. I reached an awkward corner. I back up into Jimmy Dubz to try and rotate to go in head first. We both have to back up quite a way before I can turn around. Descending head first is a bit scary but it allows me to negotiate the awkward corner. Following this is a squeeze I think known as "The Letterbox". I've got SRT gear on and make a few squeaky noises as I slither through but it's not too bad. Another awkward squeeze brings you to the head the first optional ladder climb. Due to our lack of ladders we decided we'd try it as a handline. Jimmy Dubz rigs the line to a column further back and I drop down. Its a 4m climb down it's hard to see how a ladder would be particularly useful here unless there's substantial water flow normally (it was a dry climb for us). Down another little climb we come to a junction. Right leads to August passage, which sounds grim. We choose left and mince through Showerbath chamber, a waterfall on our heads. The way is on is down a slide down a small passage directly beneath the waterfall. It's a bit moist but the water veers off soon enough. We pop out at a ledge above the Great Chamber. I opt to rig the traverse round the side rather than attempt a climb in the water (though if it's ever possible, this would've been the time to do it). I find a nice boulder to rig off and with my descender providing a psychological belay I shimmy round. It's not hard, there's nice handholds and only one particularly airy step. On the other side there isn't much to attach a rope to. I loop some tape around a shallow nub of rock and tell Jimmy Dubz to follow. Once over I tell him to hold the tape onto the rock for the next person, as I did for him. He doesn't look pleased at this revelation. Everyone now in the main chamber we pick our way down. It's very impressive! The floor slopes down at 60 degrees or so with the odd flattish ledge and the water runs over most of it. At the bottom we climb back up a mud slope on the right. The way down to the stream is not the first obvious hole in the wall here but a second higher up one. 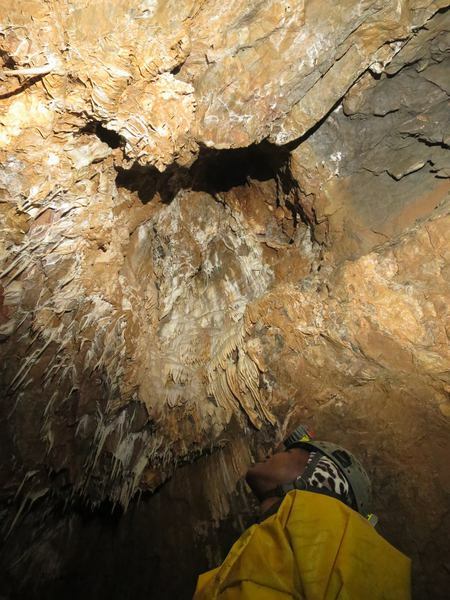 This is known as "Christmas Crawl" but is really a half metre squeeze past some calcite into another smaller chamber. From here a hole in the floor is "Swing Pitch". I rig a ladder and belay everyone down the 10 metres. An impressive jet of water is perilously close to the ladder but most people avoid the worst of it until the bottom. From there the passage is again a sharp downward sloping thing. Following the water with hands on the ceiling we climb down. This drops into the main streamway. We regroup and I randomly decide to go downstream. The streamway is narrow, and often stooping but it's incredibly pretty, the walls are almost all covered with calcite flows and stals. Every now and then the calcite has built and you have to wiggle through a constriction with the stream, often over a little waterfall into a pool below. Its obvious that this would be very unpleasant in high water but it's merely sporting for us. Ben feels light headed and asks about bad air. I'm also a little light headed but suspect dehydration. After a while the streamway opens out a little and the ceiling disappears high above. We come across a small inlet emerging from a tube 2m up the wall. Dave asks to go and look down it. I tell him that he certainly can. He does. Jimmy Dubz follows, keen not to be outdone. Ben and I sit in the main streamway with lights off until they return reporting many metres of wet crawl. We debate turning round here, as we are still entertaining the idea of popping into GB before heading home. I suggest we go round one more corner because it looks pretty. Dave leads on. Round one more corner I suggest one more and then another. Finally the passage closes down to another flat out crawl in the streamway. I am about to suggest this as our turning round point but before I can Dave is through. One more squeeze then. Fortunately beyond we arrive at a sump. Dave and James take turns inserting themselves into it, seeing how far they can get. I end the game as Dave gets up to his shoulders. We bimble out, the way out much quicker than the way in. In the awkward entrance series I get Jimmy Dubz to drag the bag in front of me, and I unstick it when it becomes stuck every few metres. I'm not sure if this was easier in total effort than one person pushing it ahead but it was definitely easier for me and I still got to look like I was doing something while JDubz did most of the work. On the surface again we fumble with the lock and then walk back, this time electing to use the obvious path that we joined halfway last time. Now the MU description makes more sense and we follow it backwards popping out pretty much next to the minibus. Mendip Underground it seems misses out a minor but crucial tip that from where you park you have to walk back up the road, away from the farm to find the path. We gather round the minibus and debate for a while the merits of going to GB. It's very hard to tell what the Wilsons' true desires are but when I eventually decide that we'll go cider and cheese shopping in Cheddar instead they both look quite pleased. Jimmy Dubz finds my croll where I carefully placed it in the grass 5 hours before. Changed I manage to get the minibus off the slippy grass verge (I was worried). Lack of ubiquitous 4g forces us to navigate by "road signs", large markers engraved with runes left by the side of the road by ancient civilisations. We have a disappointing time in town. I guess January isn't peak time but there was just one cider shop open and it was pretty pricey. Whilst wandering Ben does the unthinkable and asks a passing stranger where he can buy cider. They suggest that a mile up some road there's a big cider place. Luckily this is on our way home. We drive a mile up the road and there's no cider place. We continue on until some flashing lights and thumping music catch out attention. There's a shed by the side of the road, and there seems to be a makeshift pub in it. I do a u-ey and park next it. We walk into the 5m by 5m room. 20 pairs of local eyes tear away from their conversational partners and fix beadily on us. Even the music seems to quiet. Ben asks if they do cider to go. The woman behind the small bar points to a pair of plastic containers hanging from the ceiling with prices on. She asks what we want. Ben asks what she's got. She offers to let us taste a couple. Ben agrees, and at that moment a man bursts out from the back room announcing that we're "not interested in the taste" and that we "just want to get completely bollocksed". He then mutters something about our age and the woman asks for ID. Before we can get any though she hands us a small amount of cider to taste. ID forgotten we try a few. The Dubz brothers settle on a sweet cider. Ben asks if she has anything special for discerning customers. She reaches beneath the bar and brings up a sip of a different cider. This one has the methanol taste we're looking for so we buy a thing of it. I'm sure if went back to this place again it would be gone. I'd done GB once before on the cave first aid weekend before the NZ expedition in 2015. I remembered it as being easy and pretty, and so with a group of experienced cavers (no novices allowed in Charterhouse Caves) we went to have a bimble and take some photos. We parked at the farm, popped our quid through the letterbox and headed across the fields, watched by Shetland ponies. You have to climb the gate, there is no stile, and follow the muddy paths round to the furthest depression where there is a grey concrete bunk house. Down inside, we took the flat out crawl on the left and then the free climbs on the right. My group were impressed by the scale of the Gorge, and more so at the Main Chamber. Not wanting to try the wet free climb in the Main Chamber, we backed up and climbed over the Bridge, traversing round the pretty calcite on the left of the chamber and along until we reached the White Passage. Here we paused whilst I took loads of photographs, though my models seemed quite willing. Peter manipulated the flash and I tried lots of settings and angles. One shot everyone wanted was themselves looking up into a well decorated aven, which worked well because the on-camera flash illuminated their faces and the separate flash lit up the aven nicely. I was lying on the floor taking these, my back on some lumpy rocks and I felt quite bruised when I finally got up. We went down the hole in the floor to Rift passage, and then followed another hole in the floor down to the Gallery, where we took more pictures overlooking the Main Chamber. 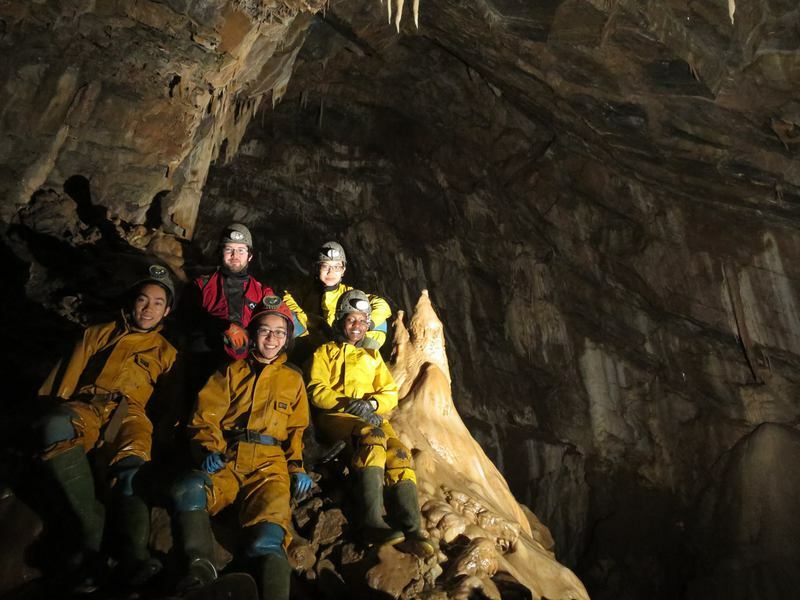 My flash couldn't light up the entire expanse, but I could get the 3m long stalactites in the foreground with the group underneath. We then went down to the main chamber via the Oxbow, and checked out the grim sump. I hadn't realised you needed a ladder to go to the Great Chamber, but I tried out the bolts just before the terminal sump. By clipping a sling to the lowest bolt using an oval krab I formed a footloop so I could stand up and touch the next bolt. Having demonstrated I could place a ladder to my awe-struck group, I climbed back down, twisting my shoulder painfully in the process. Smooth. We bimbled out, Peter leading a minor recce off White Passage, and were back at the hut just after the insane Swildon's crew who had done the short round and BLue Pencil in just three hours. The caving games the previous evening had taken out two of our best and brightest, Kenneth and Ben. Both defeated husks only fit for a tea room based afterlife. I was feeling worse for wear as well and was tempted to join them but merciless mocking from Jack and a twinkle in Tanguy's eye kept me in the caving game. I had promised the Wilson brothers an epic Swildon's trip yesterday as the price for going to the smaller, less well known Longwood Swallet. Hitching us to Tanguy's wild ride seemed an appropriate way to do this. Tanguy's plan, animated with a delightful hand gesture, was to bounced down Blue Pencil and out again without going though the ducks or Sump 1. Apparently the ducks had been unpleasant the day before and Tanguy did not want to repeat them. We gathered our gear and marched down the road. It is a significantly longer walk from the SMCC to Swildon's than the Wessex. We arrived at the pillbox to find voices echoing out. Inside a group of children was ahead of us, waiting for some others to climb up the short dry way. A man and son appeared, along with someone who I assume was their guide. The son was not having a good time. The man gave an emotionally charged speech to inspire his son to get out the final bit of Swildons. We stood awkwardly by. The children started down the short dry way so Tanguy led us on a mad dash through the short wet way to overtake them I have never been this way before and such was our speed that I don't think I could find my way if I were to return. Crawling, sliding, splashing. Tanguy in front, almost always out of sight. The Wilsons following. I bring up the rear. We pop out in the Water Chamber, no sign of the children. Down towards the ladder. We queue as is normal for Swildons. A group of children is ahead of us as well. The group we overtook comes up behind us, planning just for a look down the ladder. Tanguy belays the Wilson's and then we both abseil down. We bomb down the streamway. Accidentally climb down one waterfall too far and then back track to climb up to Tratman's. Now the real work begins. Tanguy's ridiculous pace does not relent through the crawls and climbs. We are all sweating profusely and breathing hard. The occasional stop to rest only serves to contrast the pace. We are very quickly at Blue Pencil. I have not been down Blue Pencil before but it met my expectations. Tight and downward sloping the whole way with a couple of technical climbs thrown in. Dave W did it mostly head first for some reason. Popping out by the chain at the bottom was a relief. We wandered downstream for a while till we reached a sump. Then turned back, back to the chain, and back out of Blue pencil. At this point we manage to convince Tanguy that its definitely easier to go through the ducks than back the way we came and it means we can complete the short round. At the first duck we take turns bailing. Tanguy is quite insistent on lowering the water level quite far. We try to get the siphon working but fail. With four of us though the bailing goes quickly. Neither of the further ducks required bailing (though the third was entertaining). DW and JW completing them admirably calmly. JW expressed disappointment at how unchallenging Birthday squeeze was. Down to the sump. Brief pause underneath the Wookie hole sign and then after brief instructions to the Dubz Tanguy is slips beneath the murky water. The rope thrashes three times. D Dubz disapears. Three times. J Dubz is gone. Three times. There they are again. I splutter a bit and stand. Jimmy asks where the Wookie hole sign is. We tell him he was sitting under it. He goes back through the sump to have a look. So does DW. Tanguy and I play the hilarious hide with your light off and then don't know what do do when the people find you game. Up the stream. Up the ladder. Pack the ladder. We only stop briefly in the Water Chamber. Tanguy asks if we want to do the long dry way. I am exhausted and look uncertain. He offers that it is not that long. I concede. I wasn't looking around that much as we went through so I can't say there is much to recommend the long dry way. I do the tree entrance on the way out to impress Jimmy and Dave. They dont seem particularly impressed. We check our watches. Just over three hours since we entered the cave. Madness.